Now anyone can publish and distribute a Photo Book, worldwide, that could be made available to a market over 400 million consumers. MagBooks© offers this possibility: MagBooks© publishes your PhotoBook with 200 pages of text and photographs, launches it in iTunes in the Apple Apps Store and sells thousands of copies. The author will receive royalties, ie 20 to 35% of the selling price. The MagBooks App “A40″ (Photographer Sebastian Mölleken) has been downloaded 3,690 times within 24 hours and more than 15.000 times within the next days ! YOUR PERSONAL APPLICATION FOR iPHONE and iPAD in the APPLE STORE ! MagBooks© is dedicated to Authors, Artists, Art Photographers, specialized Photographers and Editors, but also to Designers or any other professions. MagBooks© is a Publisher of Photo-Books, but also creates applications for the Apple Store, that is applications for Art, Design and Photography, which can be seen and read as a digital book. 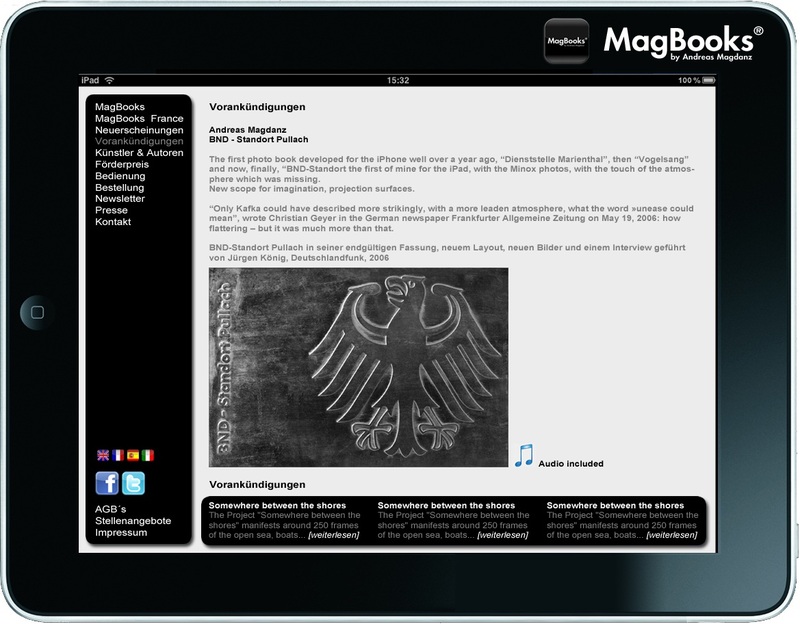 A Magbooks© Application makes it possible to download with any Artists work to iTunes, whether the Artists work is published on paper or not. These works of art can be then bought by an internaut for his iPad, iPhone and/or iPod Touch and is available to be downloaded anywhere in the world. A photographer wishes to publish 200 photographs of his own creation in Apple Store. We transform these photographs into a true numerical book in the form of a custom made application. This application is then uploaded to the Apple Store where it is downloadable on one of the 40 million iPads or/and 200 million iPhones. The application being made available worldwide can be bought by the internaut who can purchase and download this application for 3,99 $. This makes it possible for the artist / photographer to receive royalties. Please keep in mind that the 30.000.000 of applications are downloaded each day! This is a huge advantage and opportunity.